The Dayton Convention & Visitors Bureau wants authentic pictures of you and your friends or family having fun in our community! Why? Because we love showing off all things Dayton, and we want you to get in on the fun, too! Whether you’re frolicking through one of our fabulous MetroParks, checking out the top-flight entertainment at the National Museum of the U.S. Air Force, dining al fresco in the Oregon District or just chillin’ in your own neighborhood, we want to see your depiction of the things you love most about the Dayton/Montgomery County area. 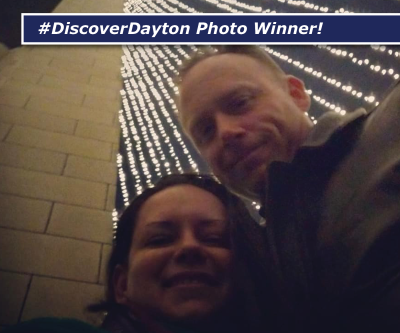 Show off your favorite photos using #DiscoverDayton, and you might even snag some cool prizes! Follow @daytoncvb on Instagram & Twitter. 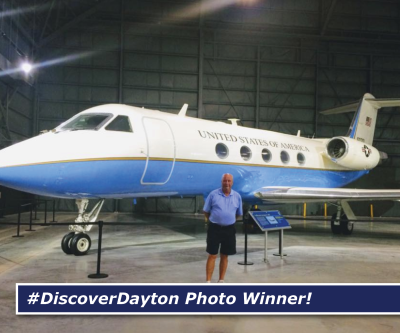 Snap your favorite moments around the Dayton region and tag your post with #DiscoverDayton and @daytoncvb. Be sure to include where you’re snapping your photos. And, don’t forget about the #DiscoverDayton sign in the Schuster Center lobby. It makes a great prop in your photo! 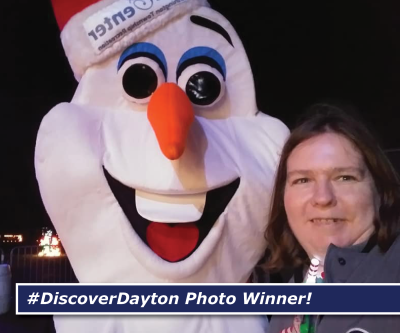 The @daytoncvb accounts will be re-tweeting and reposting your fun photos. At the end of each month, one random winner will be selected from all available entries and awesome prizes will be awarded! Must be 18 to enter; multiple photos can be submitted by an individual. PRIVACY: We are committed to the privacy of your information. We do not, and will not, distribute, disclose or sell any of your personal information to third parties, other than as required by law. This promotion is in no way sponsored, endorsed, or administered by, or associated with, Instagram or Twitter. You are providing your information to the Dayton and Montgomery County Convention and Visitors Bureau. and not to Instagram or Twitter. ELIGIBILITY: This contest is open to all @daytoncvb Instagram and Twitter followers who are 18 years of age or older at the time of entry and live in the United States of America. Void where prohibited by law. All federal, state, and local laws and regulations apply to these sweepstakes, contests/promotions. If you cannot or will not comply with these Official Rules, you should not participate in the sweepstakes. By entering this Sweepstakes, you agree to be bound by these Official Rules and to waive any right to claim any ambiguity or error in these Official Rules or the Sweepstakes itself. You also agree to be bound by all decisions of the Sponsor or its designees, whose decisions are final and binding. By entering the contest, you agree to release the Sweepstakes Entities, and Instagram and Twitter from all responsibility or liability for damages, losses or injuries of any kind resulting from participation in the Sweepstakes or any prize-related activities, if any, or any awarding, possession, use and/or misuse of prize(s), if any, awarded herein. This promotion is in no way sponsored, endorsed or administered by, or associated with, Instagram or Twitter. You are providing your information to Dayton CVB and not to Instagram or Twitter. There is no cash alternative to the prize. Odds of winning depend upon the number of eligible entries received. 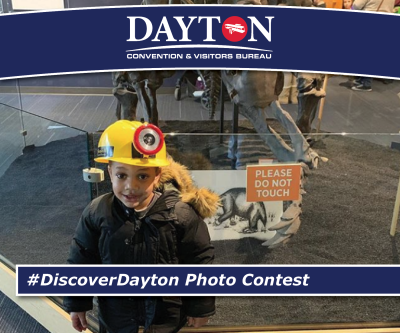 HOW TO ENTER: Beginning (November 2018—December 2019) follow the instructions to enter the competition by following @daytoncvb on Instagram. 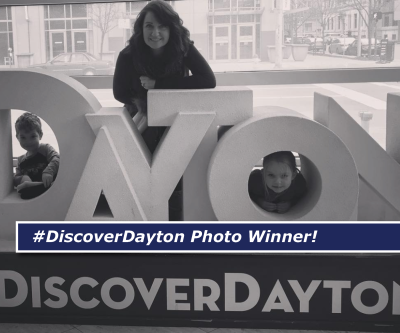 Entrants must snap a photo tag @daytoncvb and use the official contest hashtag #discoverdayton in order to be eligible. Entrants must submit their photos by the dates outlined below* in order to be eligible to win a prize. Entries received after these dates will not be included in the selection process for that particular month. Only followers of @daytoncvb on Instagram or Twitter will be eligible to win. The winner will be selected by the Dayton/Montgomery County CVB, who reserves to right the judge which photo is the winning submission. The decisions of the Dayton/Montgomery County CVB are final on all matters relating to this competition. Odds of winning will depend upon the number of eligible entries received. The winner will be notified by the official @daytoncvb Instagram/ Twitter and will be directed to email brose@daytoncvb.net in order to collect their prize. If the winner cannot be contacted within 3 days another will be chosen. There is no cash alternative. GENERAL RULES: No Purchase Necessary. Entrants agree to abide by the terms of these official rules and by the decisions of the Dayton/Montgomery County CVB which are final and binding on all matters pertaining to this contest. Non-compliance within this time period may result in disqualification and selection of an alternate winner. Return of any prize notification as undeliverable may result in disqualification and selection of an alternate winner. Images submitted must be “G-rated” and suitable for all ages of the general public to view. Entrants further grant the Dayton/Montgomery County CVB the right to use and publish their Instagram handle and photo submission in print, and in any other media in connection with this Dayton/Montgomery County CVB contest. With image submission to @daytoncvb from (November 2018—December 2019), entrant grants Dayton/Montgomery County CVB royalty-free license to display, retain and modify all images submitted. All images will be credited with the name of entrant. 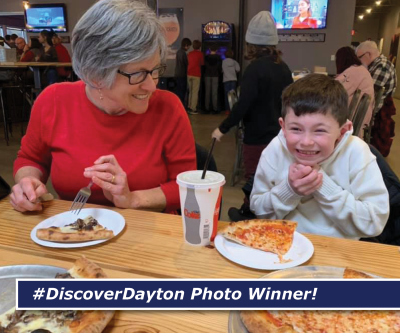 Acceptance of a prize constitutes permission for the Dayton/Montgomery County CVB to use winner’s name, photos and likeness for advertising and promotional purposes without additional compensation unless prohibited by law. No substitution or transfer of prize by winner permitted, except that the Dayton/Montgomery County CVB reserves the right to substitute a prize of equal or greater value in the event that the advertised prize is unavailable. All applicable income taxes are the sole responsibility of winner. By entering, entrants discharge and hold harmless the Dayton/Montgomery County CVB, its subsidiaries, affiliates, directors, officers, employees, and agents from any and all liability or any injuries, loss, or damage of any kind arising from or in connection with this contest or any prize won. By participating in this contest, entrants agree to be bound by these Official Rules and the judges’ decisions, which are final. In the event there is a discrepancy or inconsistency between disclosures or other statements contained in these contest materials and the terms and conditions of these Official Rules, the Official Rules shall prevail, govern and control. All material submitted become the property of the Dayton/Montgomery County CVB. The Dayton/Montgomery County CVB is not responsible for any typographical or other error in the printing of the offer or in the announcement of the prize. Except otherwise stated in these Official Rules, normal Dayton/Montgomery County CVB Terms and Conditions apply to the prizes. NOTICE TO ONLINE ENTRANTS: Any attempt by an individual to deliberately damage any website or undermine the legitimate operation of this promotion is a violation of criminal and civil laws, and should such an attempt be made, sponsor reserves the right to seek damages from any such individual to the fullest extent permitted by law. The Dayton/Montgomery County CVB is not responsible for faulty, incorrect or mis-transcribed phone/e-mail transmissions, incorrect announcements of any kind, technical hardware or software failures of any kind including any injury or damage to any person’s computer related to or resulting from participating in or experiencing any materials in connection with the contest, lost or unavailable network connections, or failed, incomplete, garbled or delayed computer transmission that may limit a user’s ability to participate in the promotion. The Dayton/Montgomery County CVB assumes no responsibility for late, lost, incomplete, inaccurate or damaged entries, or undeliverable e-mails resulting from any form of active or passive e-mail filtering by a user’s Internet service provider and/or e-mail client or for insufficient space in user’s e-mail account to receive e-mail. The Dayton/Montgomery County CVB shall not be responsible for any occurrences resulting from the entrant’s connection to the internet via www.daytoncvb.com site. The Dayton/Montgomery County CVB does not accept responsibility for any damage (whether material or non-material) caused to entrants, to their computer equipment or to data which is stored on them, or to their personal, professional or commercial activities. The Dayton/Montgomery County CVB reserves the right to cancel or modify the promotion if fraud, misconduct or technical failures destroy the integrity of the program; or if a computer virus, bug, or other technical problem corrupts the administration or security of the program as determined by Sponsor/judging agency/administrator, in their sole discretion. In the event of termination, a notice will be posted online and the contest will be conducted from among all eligible entries received prior to termination. Any damage made to the Site will be the responsibility of the authorized e-mail account holder of the e-mail address submitted at the time of entry. Proof of submitting entries will not be deemed to be proof of receipt by the Dayton/Montgomery County CVB. Any entries which are suspected of being fraudulent (including those using robotic, automatic, programmed or similar methods of participation) will be disqualified, based on determinations made solely by Sponsor. Sponsor reserves the right to prohibit the participation of an individual if fraud or tampering is suspected or if the account holder fails to comply with any requirement of participation as stated herein or with any provision in these Official Rules. Entrants participating in this Dayton/Montgomery County CVB contest agree to be bound by these Official Rules.